Every acknowledgement letter is written for the sake of recognition of the authority to the concerned department who have taken responsibility to deliver their work accordingly. It is a printed form of a written letter from the concerned department to provide recognition for the work they have delivered on a particular assignment or project assigned to them. These acknowledgement letters can be considered a letter of appreciation for the department rendering services on such projects. 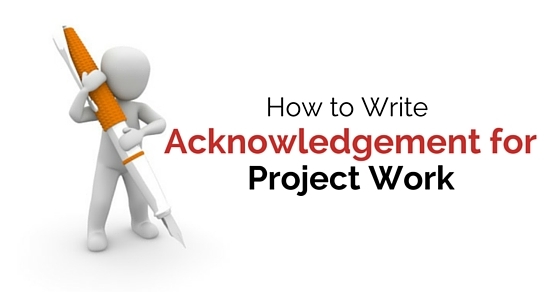 Below mentioned guidelines are some basic tips on how to write acknowledgement for project work. There is a format to follow while writing an acknowledge for project work, and these guidelines should be followed while writing it in a format. To write an acknowledgement letter, a person needs to gather all the information necessary for that format of acknowledgement letter. The details to be stated in the letter of acknowledgement should be clear with their tactful information. An acknowledgement for project report is a form of showing certain recognition for their extraordinary participation in that particular project or assignment. By stating a clear outline for the acknowledgement letter, a person can brief it effectively. Before writing an acknowledgement letter, a person needs to draft a sample acknowledgement letter which consists of all the main elements to be considered before preparing an actual final draft of an acknowledgement letter. A draft letter should be formed to understand the actual content of that particular acknowledgement letter. A draft letter helps to underline any kind of mistakes in the final draft of that letter. While writing an acknowledgement letter one need to understand that the purpose of it is to acknowledge the efforts of other departments which have participated in that particular project or assignment. Showing some sincere acknowledgement in that letter can be expressed in a better manner. Sincerity, while writing an acknowledgement letter makes it more responsible and effective. In an acknowledgement letter, all the relevant details should be entered with extreme responsibility. After writing a draft letter of acknowledgement, a person needs to provide details about the person name and address to mention them in an acknowledgement letter. So that the recognition should be maintained by the person whose contribution to a particular project or assignment is valued. Every single written letter needs to be stated along with an address and the name of the person to whom it is concerned. While writing an acknowledgement letter, the specification of the subject needs to clearly mention in that particular acknowledgement letter. By being specific about the main subject line or content of the acknowledgement letter, a person can be clear with the motive of such an acknowledgement letter. Specification of each and every content written in that acknowledgement can bring up a clear viewpoint of the concerned authority. Writing an acknowledgement letter seems like a simple job, but in reality, it is not that easy job. An acknowledgement letter should be short and specific with all the details to be entered in that particular acknowledgement letter. By this kind of short and specific details about the main subject line makes an acknowledgement letter valued in a better manner. And instead of writing an essay about the subject line, one can at least try to write what is necessary for that particular acknowledgement letter. Every acknowledgement letter needs to have a letterhead on which all the main elements of an acknowledgement letter are written. For every formal acknowledgement letter, an official letterhead should be used compulsory. Letterheads are considered as an official seal of that particular project holding organization which is required to acknowledge the effort of another organization and is treated as a compulsory or necessary act of acknowledgement. While stating an acknowledgement letter, a person writing it needs to understand the responsibility of its value. The person or department for whom this acknowledgement letter is specified should be acknowledged to them with complete respect. Every statement of acknowledgement should maintain the important phrase as respectable. An acknowledgement letter is basically drafted for the sake of respect or appreciation towards their work on such a project or assignment. Every acknowledgement letter needs to submit to the concerned department as soon they send a person their completed project detail documents. After receiving the actual complete project work of the department, other department needs to do one thing first that they should release an acknowledgement letter to that department from which they received a complete project work. Never delay while sending an acknowledgement letter because it may be considered as unprofessional. Proofread an acknowledgement letter for the sake of accurate information mentioned in that particular letter. A person needs to proofread all the elements entered in that particular acknowledgement letter. It can also be considered as a responsible act of delivering such letter and helps a person to track down any mistake written in that particular letter. There is a certain project acknowledgement format when writing an acknowledgement for the project. And these formats need to be followed while writing an acknowledgement letter. They are as follows. Every official letter to be written must have a header which consists of all the details about the letter writers name and address and along with that the name with full address of the recipient that to whom it is addressed. Following a proper header format can bring an official statement to that particular acknowledgement letter for the project. As mentioned earlier, an official letter should consist of the body as well. An acknowledgement letter needs to write in a certain format. These formats can be considered according to the body of any letter format. The closure of any official letter should end with thanking the project owner who had given this opportunity to the concerned department and also with the appreciation of the completion of project work. To end this discussion, we would state that every official letter whether it is an acknowledgement letter, appointment letter or any other letter must have a certain format of presentation. These formats of presentation are necessary to present the actual content of any kind of official letter. Therefore, to follow a certain format of acknowledgement letter, a person can follow all above-mentioned steps to present an official acknowledgement for project work.